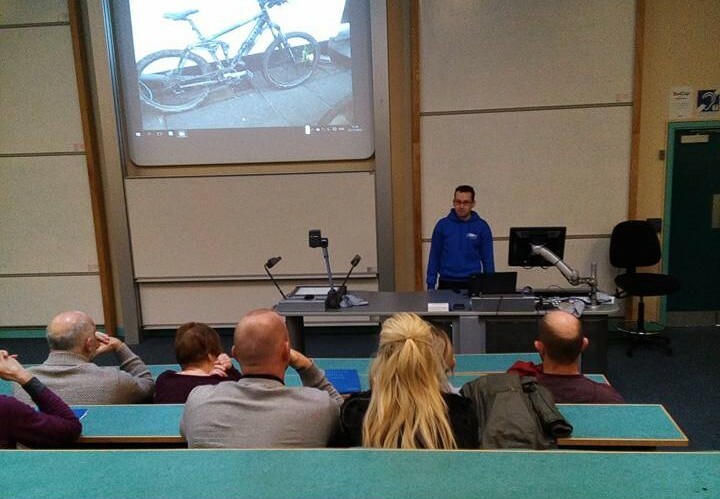 I received an invite off the JDRF to go to Newcastle to speak about riding a bike on my crazy rides and handling it being T1D at the Newcastle Type 1 Discovery Day. Being the nervous around people nerd who would rather hide behind a monitor or disappear on a bike than face people, let alone talk to a crowd, I was somewhat nervous about all this! The day came around so proudly wearing the blues again I was up at silly hours to get the train to Carlisle and then on to Newcastle. It was the first snow I’d seen this winter and it was a cold morning but the trip was smooth and on time. And plenty of tea to keep me warm all was good. The weather made it easier to be pleased at the fact I wasn’t on a bike as I had originally planned to ride to the station and then take NF, or possibly LM as a nice prop for the chat. But snow, sleet and slush. Along with icy roads and a cold wind I really think a nice comfy train was a better idea for once. After doing a lap of the building as Google Maps had decided the entrance was the rear fire escape I do eventually find my way in and see the JDRF banners. It was great to see what they do with the D community on days like this. I saw Chris the Northern Representative who I’ve met a few times now, and also Sadie who I had been chatting with about this, and recognised me from the Tour de Type 1…ok not quiet true, she recognised NF and then remembered I was the one lucky enough to be her pilot for the tour. My attempts at socialising was my usual nerd like self of worried and let’s grab another brew and hide while I supped it. Fortunatly Ian, one of my fellow riders from the mHealth Grand Tour in September also came to the day with his wife. It was great to see someone I knew and we could catch up on what had been happening of late. First up was Dr Lamb who was doing a presentation about our conditions and also current research. This soon turned into more a question and answers session which was brilliant. We learned a lot about the various implant systems under development and also some good discussions on BG equipment like the Libre and CGM’s. Must admit I never knew that we were only meant to do a BG calibration when our BG’s are flat and stable as when they are actively going up or down it messes up the calibration! Good to know though. He also went into the details on why we are “meant” to change infusion sets every 3 days *whistles innocently* which of course we all do! Basically the skin can get used to things being in it, and our immune systems can start to wall off the area around it meaning out doses go to hell, although as with many of us it seems it depends on the infusion set and the person as some peoples immune system can wall it off in a few hours, others take far longer (I guess my ten days out of an infusion set honest once just shows I’m a bigger freak than I thought). The discussions on CGM and why the Medtronic is so bad compared to the Dexcom was interesting as well, but in brief it’s a cheap design using only one electroid compared to the two on the Dexcom and thus meaning it can’t handle skipping things like a calibration as easily. It was also good to see on the Medtronic devices how the Isig value can be used to calculate the BG value etc. Always good knowing some of the maths behind our kit. After the doc was a short break before they got some loonatic cyclist on stage. Eek, that’s me! Throughtout the doc’s talk my BG was slowly ramping up and up due to my oncoming panic of what I was about to do. A quick test before the talk and it was in the low teens resulting in a massive correction, and off I go. I tried to bring up as much as possible, and cover who I was, my younger days at school and growing up. My teens and then into my twenties. Getting discharged, getting rather porky and looking at myself and thinking “you fat “^”%!&S” and deciding I’d get fit and thus we are here today with a bunch of bikes. In my usual panic mode I go for the laughs, and I hope it worked. Got a fair few chuckles and digs in at docs, nurses, testing and medical companies (sorry we love you really!). Discussed a bit about my hypo issues but sadly looking back missed out of the really crazy hypo tails grr. Brought in all my rides and made a major point of the mHealth and Orange’s fantastic support on it along with all the sponsors. And finished off with my utter failure on my London to Paris ride last month. Outside the lecture hall it was nice to chat with people and have a chuckle about some of the tails. And brilliant to get to chat with a couple of families. The whole “you can do anything as T1D” chatting with parents and the kids really does touch me. Everyone thought I was nuts, but it was really fantastic to hope that they’ll always be able to go out their and do whatever they want to do and D won’t stop them. I really hope we all can do that!